Content marketing is the process of developing and sharing relevant, valuable, and engaging content to [our] target audience with the goal of acquiring new customers or increasing business from existing customers. Defining the goals and objectives of your content marketing strategy, and creating buyer personas. 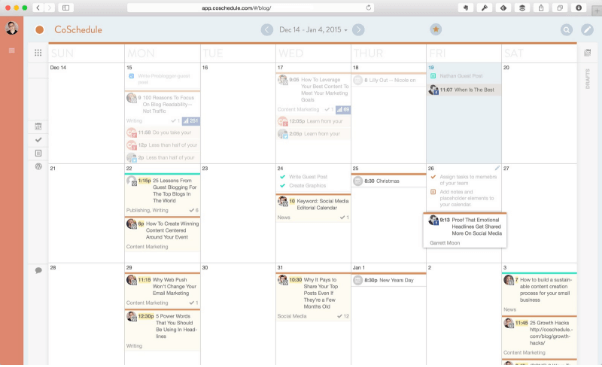 Generating content ideas and creating a content calendar. Creating and distributing your content. If you are a one-man operation, then you will be responsible for all the steps outlined here, but in businesses with multiple employees, the task can be managed by a few employees, but with input from all employees. And regardless of how many employees you have, all information should be recorded in spreadsheets and Word documents, so that it is easy to hand it over to someone new, or even to eventually outsource certain elements of your content marketing strategy. Select one primary goal, and two or three lower-level goals; then expand on them by stating exactly what you want to achieve in measurable terms, and within what time frame – these are your objectives. Each goal can be broken down into multiple objectives – each with their own measure – that ultimately contribute to achieving the overall goal. It may help to even state what impact this would have on your business: if you generate 50% more leads, what impact will this have on your sales, and your profits? Another way of looking at business impact would be to state why you selected a specific goal/objective. Record all of this on a spreadsheet with columns for your objectives, business impact, your benchmark (the numbers you hope to achieve), and columns for you to record what was actually achieved in each quarter. Defining your objectives can be a little difficult if you don’t have a clear idea of your target audience, so if you find yourself struggling a bit, put your objectives on ice until you have created your buyer personas. Since buyer personas are critical to various business decisions, they should ideally have formed part of your initial business plan. If, however, they did not, there is no better time to draw them up than when you’re dipping your toe into the content marketing pool. It is important to remember that buyer personas are fictionalised representations of your ideal customer, they are broad (think one persona representing an age group, rather than one for each age), and they are fluid – the characteristics of your ideal customer will change over time, and so should your personas. What you would need to know right now is what information is used in creating a persona, how to research this information, and how to use it. The typical information used in buyer personas is made up of a combination of demographics and psychographics, and while using a broad range is perfectly acceptable, having more detailed information won’t hurt you. Age – Does not have to be precise, you can categorise according to age groups. The age of your customers helps shape your content, with younger customers generally responding better to visual (video) content. Location – If you’re a local business, this would be broken down according to suburbs, and even streets. For national and international businesses, you would focus on cities, regions, and countries. Gender – Not all buyer personas are gender specific, but like age, knowing the gender of your customers will help shape the type of content you create. Income level – Consider both household income and how much your customers are willing to spend on your services and/or products. You may also want to assess how easily they decide to buy: do they switch from browsing to buying in minutes, or does it take days or weeks for them to convert? Education – education helps you gauge what type of content your customer would respond to, and enjoy. Family status – Are most of your customers single? Married? Do they have children, and if so, what age are the children? Occupation – You’re looking at both the industry, and the typical job title. Triggers – Why do customers buy the products you sell, and why do they buy from you? Are they motivated by price, brand, features, quality, customer service, status? Blocks – Why do customers not buy the products you sell, or why do they not buy from you? Again, are they motivated by price, brand, features, quality, customer service, status? Concerns – What problems or challenges are your customers facing that you could help with? 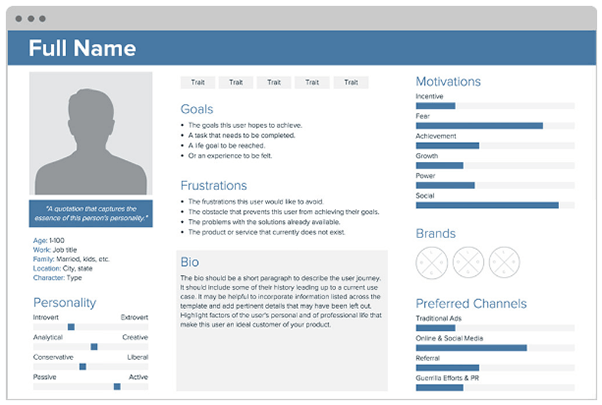 Both new and old businesses can – and should – compile buyer personas. New businesses would initially focus on their ideal target audience, eventually refining the buyer personas to include details on who their actual customers are. Older businesses would use a combination of existing customers, and customers they still hope to reach/appeal to. Hiring an agency to conduct proper market research. Asking your customers to complete a survey. Be careful not to ask questions that are too invasive, but still give you the information you need, and consider offering an incentive as a way to encourage your customers to participate. If you already collect some customer data, analyse this for any information that could help build buyer personas. 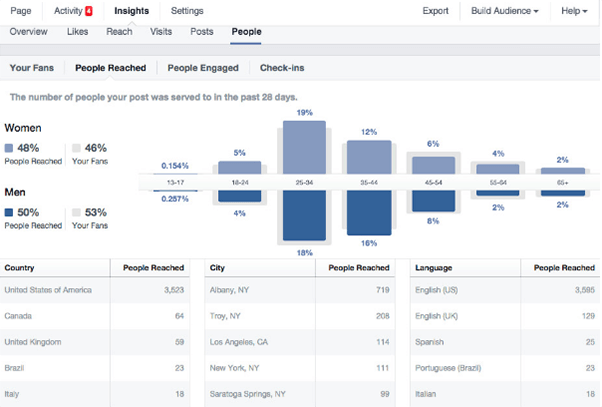 If your business already has a Facebook Page and a website, you can use both Facebook Insights and Google Analytics to source some information on your customers. Set-up a website on-page survey with three simple questions to create a simple, accurate user persona in four steps without leaving your desk. Use services such as SimilarWeb, SEMrush, Searchmetrics, SE Ranking, SimplyMeasured, Mention and Ontolo to research your competitors online. Everything from website traffic, through to keywords, social media performance and some key demographics can be found using these tools. Remember to always have buyer personas that represent both your current customers, and people who aren’t currently customers, but that you are trying to appeal to. With properly defined buyer personas you will be in a better position to tailor your content marketing to appeal to the right people. You will do this by not only first selecting the best topics to write about, but by then assessing the completed article – before you publish it – to see whether it addresses specific problems – triggers, blocks and concerns – experienced by your target audience. Once you have created – or updated – your buyer personas, you should revisit your objectives and refine them to ensure that they are achievable based on your target audience, including any smaller steps that feed into each objective, and the time frames assigned to each objective. 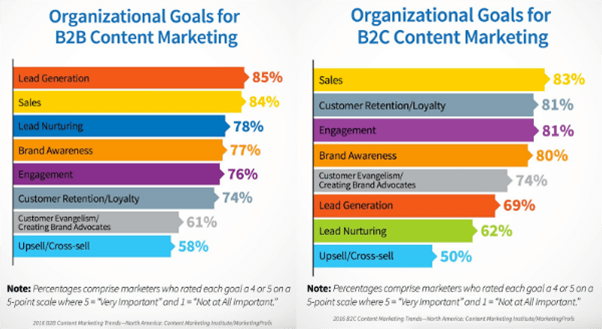 Both your objectives and buyer personas are crucial to the other two stages involved in creating your content marketing strategy. One of the most demanding challenges facing all businesses with content marketing strategies is producing the actual content. 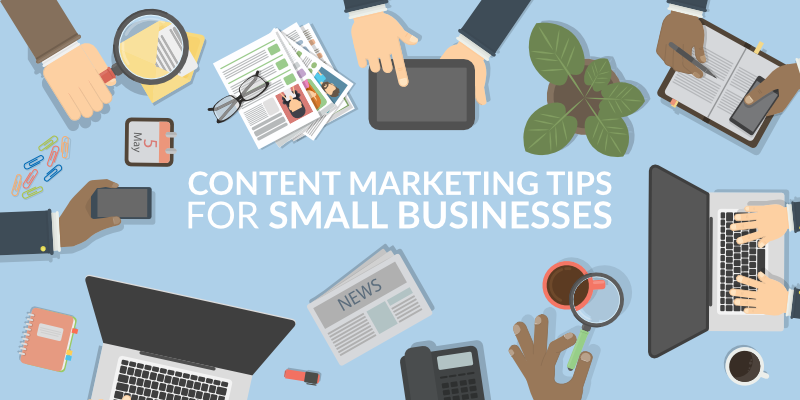 For larger businesses, it is the task of finding a steady stream of topics to write about, while smaller businesses have the added burden of finding time to actually create the content. Finding topics can be made less frustrating by knowing where to look, what questions to ask, and by maintaining a digital swipe file. There are also steps you can take to make producing the content easier, but those are covered in more detail in Stage 3. What you first need to do – and this relates to generating ideas, maintaining your content calendar and actually producing the content – is decide what type of content you are going to produce, and how often you are going to publish. Both are influenced by the resources you have at your disposal – skill, time and money – with the principal aim being quality over quantity, followed by consistency. Once you have established that, you can move on to creating your digital swipe file, an ideas spreadsheet, and finally, your content calendar. Dewey – a free bookmark manager for Chrome, with support for custom tags and smarter searching and sorting of your bookmarks. Pocket – a save-for-later service with both free and paid options. Like Dewey, Pocket supports custom tags, but works across multiple browsers, devices, and apps. Evernote – also similar to both Pocket and Dewey, but branding itself as a note taking app. Evernote works across multiple browsers and devices (paid plan required to use on more than 2 devices), and supports tagging of saved articles for easier sorting. You will need to opt for the premium version if you find yourself saving a lot of notes, ideas, and web pages. A rough outline of the idea. The form it will take: will it be a blog post, a video, a social media update, an infographic, etc. The title – this can change, but having a possible title does help shape the article. A column for notes, where you can expand on the idea, and make general notes relating to the content. The spreadsheet is quite important, because although you are collecting content for ideas in your swipe file, the spreadsheet is where you start putting them together: giving them titles, matching them to specific personas, and identifying common themes. It can be a standalone document, but adding it as a separate worksheet on your objectives spreadsheet works better; that way all the information relating to your content marketing strategy is kept together. 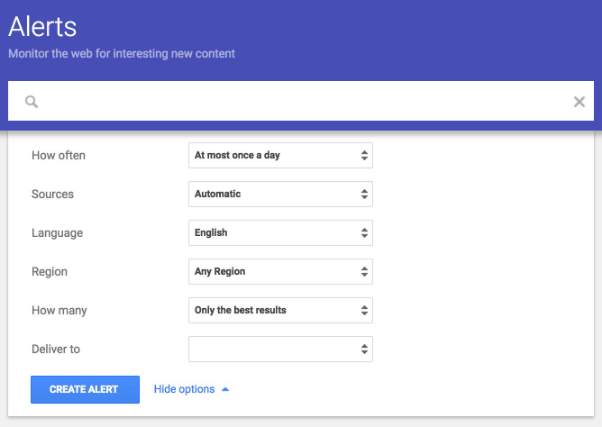 Setting up Google Alerts for selected keywords relevant to your industry and your audience. You can customise the options for these alerts to what works best for you, from the source, through to how frequently you receive them, what region(s) to include, and how many results are included. Setting up a traditional RSS feed of your favourite websites and topics. 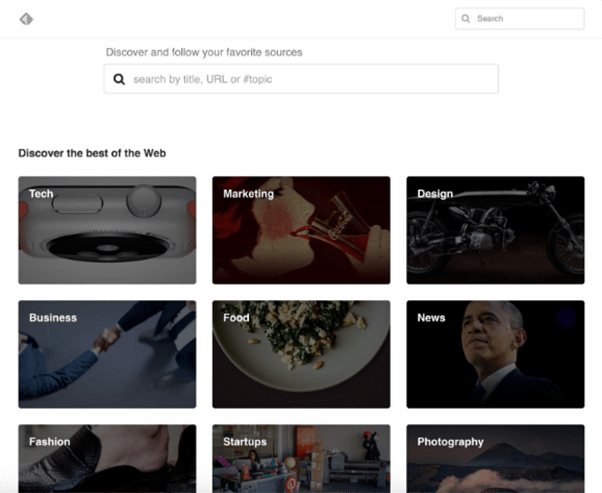 Feedly is a great RSS service, with a simple UI; and adding or discovering websites and topics is incredibly easy – you can either search for URLs and topics, or browse their curated collections. Feedly integrates with services like Pocket, Evernote, Instapaper, Trello, and Slack, so it’s incredibly easy to save articles for later, or to even share articles with other people in your organisation. 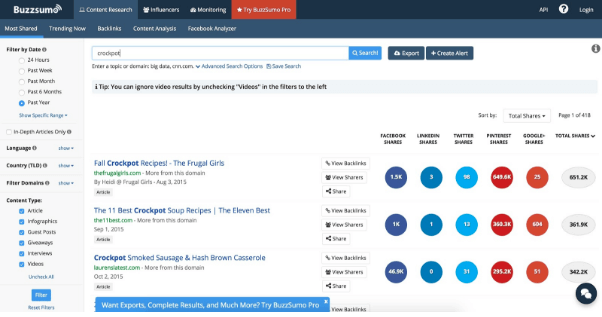 Use Buzzsumo to search for popular content using keywords or URLs. Buzzsumo is a paid tool, but it allows you to filter results, showing you how many times specific articles were shared across a variety of platforms. This gives you an idea of how in demand certain topics are, and allows you to see what type of content is most frequently shared. Search Quora and Reddit for the topics you plan on covering to see what questions people are asking, and what discussions take place around these topics. 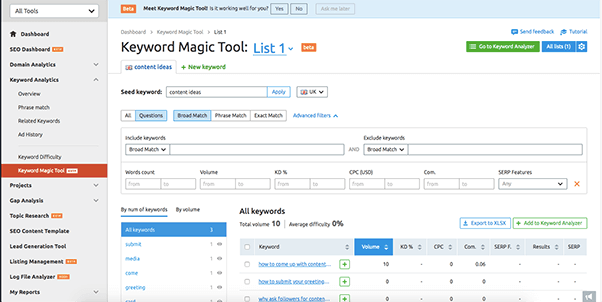 You can also use SEMRush to discover what questions people are using in search queries for specific keywords. And the generated report includes the total search volume for each question, making it easier to identify hot topics. Pay attention to what people are talking about: strangers, your customers, social media, popular news sites. Ask yourself if any of what they are saying relates to your industry. Don’t latch onto trending topics just because they are trending, always first consider if it links to your industry in any way, and if so, how it could affect your business, and your target audience. Some trending topics also have an incredibly short lifespan and are only relevant for a few days or weeks before being completely forgotten about. Whenever you select topics, always consider how they affect your business, your industry, and your target audience. Don’t rewrite what someone else has already written, but rather tailor each bit of content so that it is relevant to your audience. Focus on specific points, leave out what is irrelevant, and always ask “what parts of the topic haven’t been covered yet?”. Find which of the above suggestions give you the best results, and then ensure you set aside time – at least once a week – to go through them, and add new ideas to your spreadsheet. Don’t be afraid of adding more ideas than you could possibly use; you will eventually find that some topics can be combined, while others will naturally rise to the top of your list by being more relevant to your target audience. Once you have all of the above in place, you need to create – and populate – a content calendar. Your ideas spreadsheet is a loose collection of ideas, while your content calendar shows exactly what content you are going to share, where you are going to share it, and when. The day and date on which the post will be published. The type of content it is (video, Facebook update, Instagram photo, blog article, infographic, etc.). The objective or goal, referencing the spreadsheet you compiled previously. Any keywords you are using in the content. Post metrics, e.g. the number of views, shares, comments and/or sales the post generated after being published. See any days/dates where you haven’t got any content lined up. Match content topics to specific events and/or holidays. See that your spread of content is balanced, and that it is relevant to specific buyer personas and the buyer-cycle stage. There are many ways to generate content ideas – from paying attention to your customers, to scouring the internet – but it is important that you find what works best for your business, and never stop adding new ideas to your idea spreadsheet. And don’t even think about skipping past creating a content calendar; it doesn’t only add structure to your content strategy, but it will also help you in scheduling time to produce content that is valuable, and generates good results. Creating and distributing content is easy when compared to the work required to lay the foundation of your content marketing strategy – and that’s assuming you actually did what is required for your content strategy. Granted not everyone is confident of their ability to create content, but an overlooked blessing of content creation is that you don’t have to do it yourself. If you feel that you lack the commitment – and ability – to regularly create content for your website and social media accounts, you can assign the task to an employee with the required skill – and time – or better yet, outsource it to freelancers. Putting your content strategy together takes times and effort, but for the most part, it is a once-off process, with any refining and tweaking of the document requiring less effort. Maintaining a steady stream of content ideas also requires some effort, but it is something you can do in short bursts a few times a week. Actually creating the content, however, is something that shouldn’t be done in short bursts, but rather started and finished in as few sittings as possible. Depending on the type of content being created, you will need anywhere from two days, through to 10 weeks, to produce a single piece of content. Blog posts and images can both be produced in a few days, while videos, eBooks and infographics all require a few weeks to produce. Establish the topic – this would preferably be the next topic on your content calendar, but could come from your idea spreadsheet if you haven’t yet created a content calendar. Determine what type of content this will be – will it be a blog post, a social media update (text or image, or both), a video, etc. Decide on a headline (for blog posts) – good headlines immediately spark interest, and encourage people to read the article to discover more. At this stage, the headline can be rough, because it will help set the tone and structure of the post, and it can be edited again at the end before you publish. Select the objective of the content (what do you hope it achieves), and the audience it will appeal to (using your buyer personas). As with headlines for written content, this helps shape the structure and sets the tone. Choose keywords (for blog posts) – compile a rough list of a few keywords (individual and long-tail) to include in the piece, and to aid discoverability. Unless you have the ability and skill to create specialised content such as videos, complex graphics, infographics and eBooks in-house, these should always be outsourced to professionals, with you focusing primarily on written content. Researching the topic – this would entail either referring to your digital swipe file or doing advanced searches so that you can familiarise yourself with the latest trends and developments relating to your topic. You should already have a rough idea of what you want to cover in your post, so keep your research focused on these areas. Set aside a block of time, and start writing. In the beginning, the process might be a little slow, but eventually, you will have a better idea of how much time you need, while also establishing your own work-flow. Try to avoid editing while you write – your first draft can be very rough since you will have a chance to polish it before you publish. Some writers prefer to let their first draft rest for 1-2 days before they edit. the structure – is it easy to read? Avoid long paragraphs, and break the article into sections using subheadings and bullet points. the content – will it matter to your audience? Does it answer their questions, or provide them with the solutions they need? the keywords – have you managed to include the keywords you selected and do they appear naturally within the content? the tone and the language – will it resonate with the intended audience, and is it similar to what they would use? your objectives – does the finished article still align with the objective(s) you selected for the piece? A good editing tool like ProWritingAid will highlight unclear language and awkward sentence constructions so that you can make your content easier to understand and follow. Good content is engaging, and sometimes thought provoking: it should either answer questions your audience has, or expose them to new information that they find valuable. Finding a topic that hasn’t already been written about is tricky, but instead of rewriting what someone else has already covered, look at how you can make the topic more relevant to your specific audience. 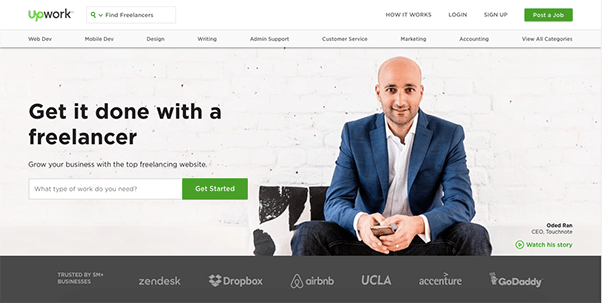 Using services such as Upwork, ProBlogger Jobs, 99Designs, FlexJobs, Hubstaff, or Toptal. Speaking to businesses you network with, and asking for referrals. Naturally, you aren’t going to hire the first freelancer you come across, but rather interview several to find someone whose body of work most matches what you want for your own content, and whose services are affordable to you. When using freelancers, it is important that you provide them with a clear brief of what you want each time, giving them enough information to work independently, without you controlling the process so much that you end up limiting the creative process. You should know what their terms are regarding revisions/changes, and how much time they need to produce a single piece of content. And try to not limit yourself to only using one freelancer: have a pool of freelancers you can choose from, so if one of them is unable to deliver, you have others to fall back on. Using your website to distribute most of your content is a no-brainer, after all, it is where you want most of your customers to end up, either learning a lot more about you or making a purchase if you have an online store. But the online behaviour of customers is constantly changing, and simply having a frequently updated website is no longer sufficient. Although you social media strategy may differ slightly from your overall content marketing strategy – with an emphasis on visual content, including video – any blog posts you publish on your website should also be shared on appropriate social media channels: Twitter and Facebook for all businesses, with the addition of LinkedIn for B2B businesses. You can only have clickable links in Instagram posts if you post an update as an Instagram Story, have a business profile, and have more than 10,000 follower, or pay to promote a post, as you would on Facebook. 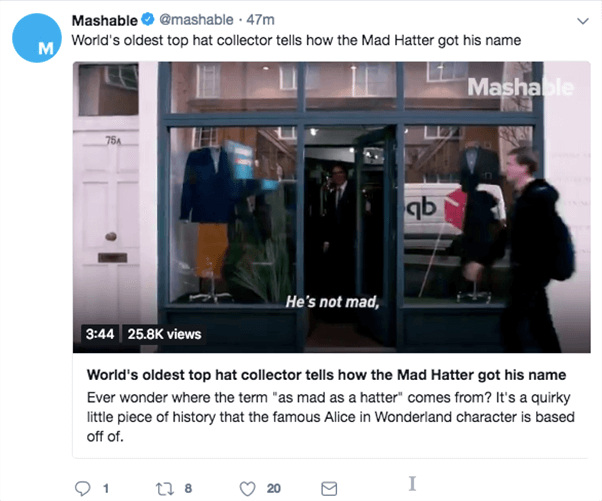 Make sure you have enabled Twitter Cards for your account so that any website content you share on Twitter remains largely visual. When it comes to video content, you are no longer limited to only using YouTube, with videos on Facebook gaining popularity, and Twitter now allowing videos of up to 2m20s in length. And remember to form a habit around sharing content to your relevant social media channels via tools such as Buffer and Hootsuite, so that you can schedule the bulk of your content sharing in advance, and never worry about forgetting to post something. All your efforts in creating a content marketing strategy, and then publishing awesome content on a regular basis, are for naught if you don’t measure the impact on your business. In Stage 1 you outlined the goals and objectives of your content marketing strategy, but you won’t know if you are achieving any of them if you aren’t measuring the performance of your content. But analysing the performance of your content isn’t good only for seeing whether you are meeting your goals and objectives, it also helps you to understand what type of content and topics truly appeal to your audience. When you first implement a content marketing strategy, much of what is in it is based on guesswork. Early research will give you some clues as to what to focus on, but it won’t be comprehensive and you will need to fill in the gaps by making a few assumptions. But once you start publishing content and analysing the performance of each piece of content, you will be able to identify exactly what topics and types of content appeal most to your customers and audience, allowing you to refine you strategy further, and making it easier to identify new topics to cover. But while knowing what to measure – and how to measure it – is no rocket science, it does deserve more space than this article allows. Once you have started creating, or adjusting, your content marketing strategy, you can read throughour definitive guide to marketing analytics for an in-depth look at all the metrics you need to understand and analyse. There are no shortcuts to researching and creating your content marketing strategy, and the more effort you put into it, the better your strategy will be. However, when it comes to actually creating content, you don’t have to do it all yourself. As long as you are still assessing all content before it is distributed, you can quite comfortably get an employee or freelancer to create all your content, without the need for a massive budget. And finally, when distributing your content, remember to always focus on the channels used by your audience – why work frantically to keep six different channels updated, if the bulk of your audience are only using two of them?